Since 1929, the Roseland Park Country Club has operated as a nonprofit organization, providing members with sporting and social events. Affectionately known as the “Roseland Club,” it is supported and maintained by volunteers from its private membership. The Club has a diverse group of Board Members, executives, and volunteers, who contribute to the ongoing management of the club. Club members can enjoy activities including tennis, pickle ball, bridge, bocce, mahjong , pool/snooker/billiards , karaoke and Men’s and Women’s social groups. Built in 1929 and extensively renovated in 2008, the clubhouse Is a great location for a variety of events with its charming Fireside, Princess and Board rooms, a serving kitchen and in-house bar licensed under LLBO, a ramp and wheelchair accessible main floor washroom. The Clubhouse is open to all members of the Roseland Club for events, socials and gatherings. The building contains three main rooms, the largest of which is the Fireside Room with a capacity of 100 people. Accompanying the Fireside Room on the main floor, the Princess Room features floor-to-ceiling windows and skylights, creating a beautiful naturally-lit space. On the lower level of the Clubhouse, members can use the Board Room for meetings and activities and to play pool, billiards or snooker. This room is also used by the Material Obsession group for sewing and quilting. With a serving kitchen on the upper floor, the Club regularly hosts catered luncheons and dinners. For smaller gatherings, tea, coffee and light refreshments can be arranged. Liquor licensed under the LLBO, the Club offers an in-house bar in the Princess Room and a trained bartender is available for special events. The facility is air conditioned during summer and heated during the winter months. A popular feature of Roseland Club, in 2016 the Club invested in resurfacing the courts and installing floodlighting for evening play. 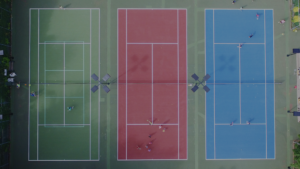 Three courts are available for member use and individual and group lessons are offered during the summer from the resident Tennis Pro, in addition to clinics, tournaments and children’s junior programs running May-June. As an additional feature, Courts #2 and #3 are painted to allow members to participate in the sport of Pickle Ball which is a quickly growing sport. The Roseland Club is surrounded on its eastern side by club-owned, undeveloped parkland. With a baseball diamond and open green space, this land is a breath of fresh air evoking the natural beauty of the area. It is available to the public at the user’s own risk. The Lawn is a great summertime venue for lawn sports and outdoor events. Members often use the space for bocce. The Club features a gravel parking lot for member use. Members are required to display their parking passes while attending club events. With 2.5 acres of land, the Club’s Clubhouse, tennis courts, lawn and surrounding parkland are set in the heart of the lovely Roseland residential community.